Pedro is our 8 month old bundle of fluff and love and his quirky personality never ceases to amaze and amuse us. He loves holding onto a toy whilst being dragged along on his belly with his legs dragging behind him but at his size now, it's back breaking fun. I have the pleasure of spending most of my time with him and feel safe and secure with a 35+ kg dog sleeping on my feet (yes, on) whilst I work from home. Hair in just about every nook and cranny is a small price to pay for his company. 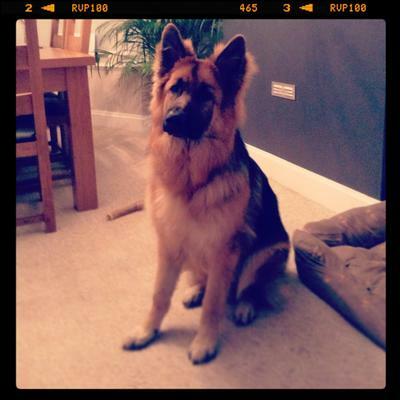 Thanks so much for taking the time to share your handsome German Shepherd Dog with us all here. He certainly is a handsome boy and a fine example of a GSD! I'm sure he excels at all his jobs too - chief of security and many more. Good for you having him help you like that while you're at home. I know having him there gives you piece and companionship too! What a nice combo. Pedro is a handsome pup! He grow into a strong and confident adult male and a Protector. German Shepherds are Amazing just what and see. Take care of your boy and he will take care of you!